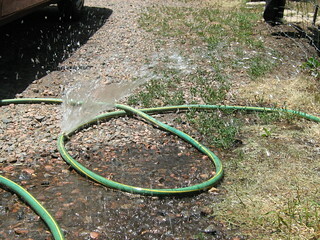 My dad invested in a very good garden hose for his first home as a newlywed in 1974. It finally burst quietly on a hot summer day, sounding like a sprinkler so we went outside to see what was making the noise. It looked like a dime-sized area had weakened in the inner wall of the hose, swelled and burst through the outer wall of the hose, which I described on my Facebook wall as the hardware equivalent of an aortic dissection.